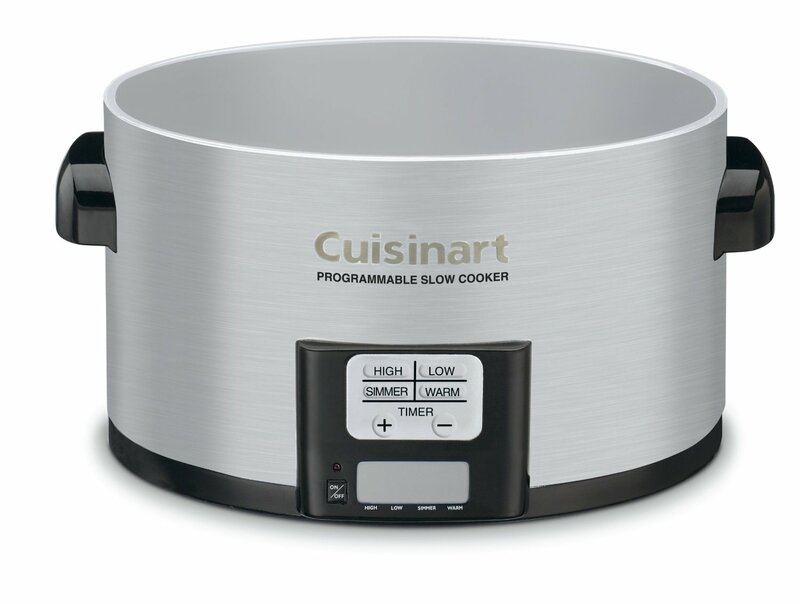 Cuisinart 3.5 Qt Slow Cooker – Find Out If It Is A Good Buy! Slow cooking is growing in popularity because it has many advantages over other cooking methods. If you are looking for a good way to get started with this healthy and hassle free way of cooking the Cuisinart 3.5 qt slow cooker is likely to be exactly what you are looking for. If you are not sure, whether this is the right type of slow cooker for you please read on. On this page, we are going to tell you everything you need to know about the Cuisinart 3.5-quart programmable slow cooker. By the time you reach the end, you will know for sure whether this particular crock pot is right for you and your family. Before we tell you about the slow cooker itself, we want to tell you a bit about Cuisinart first. To ensure that you get good value for money it is important to know a bit about the firm you are buying from. Unfortunately, when it comes to home electrical appliances there is a lot of rubbish out there. It is all too easy to end up buying a piece of junk that does not work as advertised or breaks after only a few months of use. Our aim is to help you to avoid doing this, which is why we always check out the firm who makes the product and the customer reviews before recommending something to our readers. If you are in the market for a slow cooker Cuisinart are a brand you can trust. They are an American firm that have been making small electrical appliances for home use since 1971. Carl and Shirley Sontheimer founded the company when they saw a food preparation machine demonstrated in France. Mr Sontheimer used his engineering to come up with a cut down model that was suitable for home use. He developed and made the first true home food processor and presented it at the National Housewares Exposition in Chicago. It was an instant hit. Many households are still using Cuisinart machines that they bought decades earlier. Today they make a range of cooking appliances including the fantastic Cuisinart psc-350. Their products have a reputation for working well and lasting. They are not the cheapest on the market, but only cost a few dollars more. The fact they last means that they represent excellent value for money. OK enough of the bland stats. What you really need to know is what people who have actually bought and used this Cuisinart crock-pot have to say about it. Below is our summary of the reviews, forum posts and Q&As we have read for the Cuisinart slow cooker PSC 350. This crock-pot has been available since 2008, which means many of the reviews we read were for crockpots that had been used on a regular basis for years. Importantly the recent reviews for this product were as good as the early reviews. This means the manufacturer has taken care to maintain their standards. Over 80% of the reviews we saw gave this cooker either four or five stars or 10/10. It really is that good. The Cuisinart psc-350 slow cooker is a good option for couples as well as families. It has a slightly smaller capacity than many others do on the market, which makes it easy to cook a small amount in it without the need to cut the ingredients up too small. For the most part the reviews were good, so we feel fine about recommending it to our readers as a good appliance. However, it does appear to cook slower than some others on the market do, but this can also be seen as a plus. It means that you really can set it in the morning and come home after a full 8-hour shift to a hot meal that has not overcooked. Previous PostSlow Masticating Juicer ReviewsNext PostWhich Are The Best Wall Recliners?